Adria's Notebook – Page 3 – Providing insight in disability through the lens of my personal experience. My name is Adria Nassim. 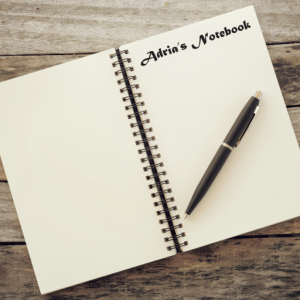 Welcome to my bi-monthly blog, Adria’s Notebook. The aim of this blog is to provide insight in disability through the lens of my personal experiences. I am 31 years old and am originally from Floyd County, Indiana. 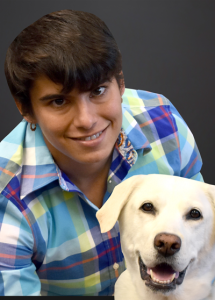 I now live in Bloomington full time with supplemental supports in the community and help from my autism/mobility service dog, Lucy, named for The Beatles’ “Lucy in the Sky with Diamonds.” I became involved in self-advocacy at a very young age as a result of my experiences with my peers with and without disabilities. I grew up with cerebral palsy, a learning disability, and an autism spectrum disorder, and received both regular and special education services in school. I also received weekly physical therapy sessions from the time I was 14 months old to help with cerebral palsy. I finished high school in May of 2005 and then went on to college at Brescia University, a small, private liberal arts college in Owensboro, Kentucky. I graduated in May of 2010 with a Bachelor of Arts in English and Spanish. I knew I wanted to use my life story to help create a better world for children and young people with disabilities. Throughout the academic year, I visit classrooms at Indiana University Bloomington, Ivy Tech Community College, and speak to parents and professionals about my experiences with disabilities. I am employed at the Indiana Institute on Disability and Community as a self-advocate part time and also write a bi-weekly column for Bloomington’s city newspaper, The Herald Times, about autism and disability published every Tuesday. I am really excited about the opportunity to share my experiences with students, parents, professionals, and those with and without disabilities, in hopes of helping them become better prepared and more excited about serving the next generation of children, adolescents, and adults with disabilities.